This morning broke bright and beautiful. We had our first view of the beach beneath our window by daylight. It was a gorgeous white sand arc framing a turquoise plane with an ever so subtle color gradient as the edge was approached. Truly an elegant study in color field painting. But we had not come here to enjoy the beach. We had come to devote a couple of days to exploring Uxmal and Chichén Itzá before we went our separate ways for a week of travel. As is common in large Mexican hotels, we could have a continental breakfast in a lounge area on our floor in the hotel. We had an breakfast of wonderful fresh fruit, papaya, pineapple and melon, fresh squeezed orange juice and a selection of small sweet pastries and coffee. When done, we returned to our room to pack. I wrapped the errant temporary cap for my molar carefully, though it was pretty battered looking, and placed it in my purse. Before checking out, we visited one of the shops in the hotel to purchase maps of the Yucatán and Quintana Roo states and to get a couple of disposable Kodak cameras. When we went to the desk to check out of the hotel, we had the misfortune of being in line behind one of those Americans who examine every item on their bill in great detail and cannot leave until they challenge some entry, no matter how small. In this case, it was extremely trivial but the discussion took at least 15 minutes while he established his authority in this matter, followed by a long dissertation on what a nice stay they had had in Cancún. We were finally able to check out and recover our car. We got directions on finding the road to Mérida from the doorman before we left. By daylight we could see that we were in the middle of a dense array of hotels built to cater to American tourists. There were restaurants, fast food outlets and souvenir shops packed wall to wall on the side of the street away from the beach. Traffic was heavy with a Fort Lauderdale at spring break atmosphere. We just wanted to get away from the area as fast as we could. In the midst of the chaos, we missed the turn and wound up in the town of Cancún, not really associated with the hotel strip which had taken over the beach. Cancún itself is a small town, hardly found on maps of Mexico a decade ago. The streets are not arranged in a manner that Thomas Jefferson would approve. We headed down one main artery, finding nothing that looked likely, finally stopping to ask directions. But none of the local people spoke English. We continued on a bit until we started to leave town and still had seen no road signs. A police car was just ahead on the other side of the road so we made a U-turn and stopped to ask directions of the pair of policemen. One of the policemen understood a little English and directed us back toward town with an approximate distance to go until we found the right road. I was keeping an eye out for street names and spotted a sign that said Chichén Itzá with an arrow to the left. We took the turn and in another block or so found Chichén Itzá Ave., which sounded like the right street. We turned west and drove through the town on this street whose surface deteriorated steadily as we neared the outskirts of the town. Then we began to encounter the topos (speed bumps) that are used to control traffic on Mexican roads in the outer regions of inhabited areas. Steve was not convinced that we were doing the right thing, but I insisted that we press on. We passed many small businesses and repair shops. Then signs began to appear indicating that the main highway intersection was a few miles ahead. When we reached the junction, we finally joined the highway that we had been looking for and which would take us straight to Mérida and then on to Uxmal, bypassing the towns. But I had enjoyed the tour of the Mexican side of Cancún. Now I could really feel that I was in Mexico instead of that pasted on blister on the town intended to cater to pleasure seeking Americans who had no interest in seeing the poverty that existed just a mile inland. On the highway, which was divided with 2 fast lanes in each direction, we could zip along over the flat Yucatán limestone formation, through the almost uniform height vegetation, with only occasional hints that people lived here. Sometimes you would see a small hut beside a cultivated field 50 yards off the road. Two or three times there was a man riding a heavily loaded bicycle using the highway as a convenient way to convey building materials home. But the foliage was so dense, just off the roadway, that we could see little. Approximately half way to Mérida we stopped at a service area in the central divider to get some snacks and soda. Here a group of small sheltered cubicles had been built and were rented out to local people as shops. We passed on the tacos and tortillas, but got some sodas and some potato chips and exchanged greetings with the husband and wife who ran the shop. Getting back on the road, which was not heavily travelled, we continued on toward Mérida while I examined the maps we had purchased to find the bypass around the city. The bypass did not really go around the entire city; it just bypassed the city center. We decided that, since it was time for lunch, we would go on into the city and find a nice restaurant. It was quite easy negotiating the streets of Mérida and we found the downtown area easily. We found a parking lot just north of the city center and parked there. There were several children working there, offering to wash the cars. We told the young girl that she could wash the car for us and were rewarded with a big smile. We walked the couple of short blocks to the local park and decided to eat at a restaurant, La Bella Epocha, which was highly recommended by our guidebook. We were seated on the second floor balcony, overlooking the park and the activity below. I ordered the chicken breast baked in banana leaves, a local Yucatán speciality and enjoyed it immensely. This was more like the Mexico I wanted to visit; not Cancún. In the park below we could see refugees from Guatamala selling their wares to the students and businessmen. After lunch we walked back to get our car and to pay the young girl. It seemed to be to no purpose to ask why she wasn't in school. We liked Mérida and decided to try to fit another visit to the city into our schedule. 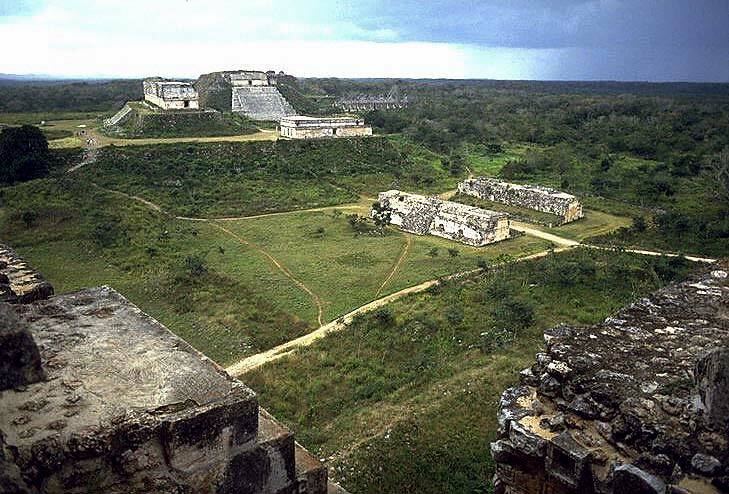 For now, we would push on to Uxmal so that we could spend as much time as possible at the site. The road went south, passing through several small pueblos (the Spanish word for towns) where we could see the wares of the shops visible from the road; beautifully embroidered blouses and dresses hung from the shop doors; signs for ice cold sodas were displayed. Then suddenly the land, after having been absolutely flat all the way from Cancún, began to rise sharply up the Puuc Hills. The road twisted up this steep incline and heavily loaded bicycles appeared around a bend, on their way downhill. The riders hopped off and pulled their bicycles to the side of the road, which was not wide. We drove carefully now because the road and the terrain had changed. Not far ahead we saw the sign for Uxmal and turned off the highway and headed toward the pyramid. We had reservations at the Villa Arqueologicas, just outside the gates. We checked in quickly, dropped our bags and headed for the entrance to the Zona Arqueologica. It was a short walk, past the shops set up to sell souvenirs to the tourists, through the lush vegetation, to be confronted by the sight of El Adivino (The Temple of the Magician). You realized instantly that it was not quite what you had expected, but it took a while to realize what the difference was. 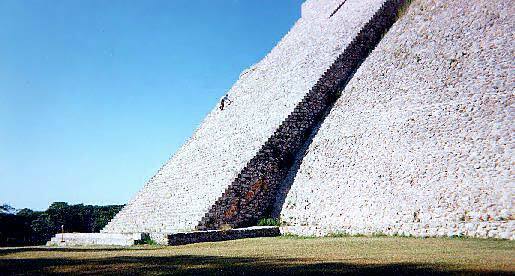 We see so many pictures of the pyramid at Chichén Itzá that we expect to see a smaller copy of it at Uxmal. But it is not at all the same. 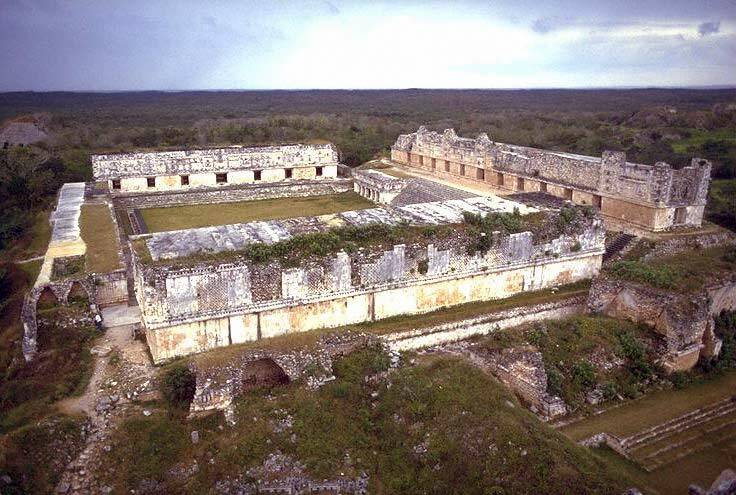 At Uxmal, the pyramid is all rounded forms, accurately placed, to be certain, but not squared off. The crossection of the pyramid is rectangular with highly rounded corners, and the surface is formed of rounded river stones. The only squared off forms are the staircases up each long side and the temple at the top. I declined to make the climb as it was extremely steep, but Steve climbed to the top. While he was climbing, I walked around the base of the pyramid getting a feeling for the entire structure, as well as for the surrounding structures. They are constantly working on restoring the buildings and piles of numbered stones were found around every turn. There were also large igunas which would climb on the pyramid and the stone piles. When Steve had made his way down the other side of the pyramid and joined me, we went on to explore the other structures here. It was obvious that the jungle vegetation was constantly trying to take over the site again. Narrow paths had been hacked out leading to the other parts of the site. We went first to the Governor's Palace, a long low building with small interior "rooms", some of which could be entered. The rustling sounds above us indicated that bats were present. The facade of the building was carved into incredible interwoven forms with "gargoyles" of stacked masks extending outward at the corners. It was necessary to examine the building both from a close vantage point and from a distance in order to get a good feeling for the integration of the form and the decorative aspects of the structure. This building was on a local high point in the landscape, in fact on a specially built platform. We could see the top half of the pyramid above the treetops. There was a long sloping lawn in front of the building with a sculpture of a two-headed jaguar centered before the building. It was possible to scramble down slopes behind the building and along the only partially exposed walls of another structure, the Great Pyramid, to get a feeling for how extensive the building had been here at Uxmal. You could also look down, at a very oblique angle, the roof comb of an unexcavated building known as the Dovecotes, because of all the small openings in the structure. We did some scrambling over these areas but were tempted on to another trail that had been hacked through the vegetation heading back to a region north of the pyramid. As we came out from the back of the Governor's Palace, the House of the Turtles was before us. It is a small but beautiful building. It's name comes from the turtles that decorate the cornices. As we walked along to the north, we became aware of a regular sound of chopping and saw a corps of men whose job was to continually beat back the jungle. They were hanging on the side of another sloping wall just below us, chopping away at small trees which were trying to gain a foothold in the ancient structure. At the end of this trail we emerged at a large, football field sized plaza, surrounded on all sides by low buildings again with heavily decorated facades. It was extremely distressing to see where sections of these facades had been cut away from the building, in the era before the Mexican government moved strongly to protect the heritage of the Mexican people, and shipped off to be sold to museums and collectors for high prices. By seeing what remained, much of which was extremely intricate, it was easy to feel the deep loss of this material, which would have so much more value were it still in place on the faces of the buildings. Ladders were propped up on the buildings in several places and workmen were obviously busy working on the restoration of this section. We spent much time here, seeking different vantage points from which to view this group of buildings. Walking around on all sides, we could only imagine what was to be seen in the missing sections of the facade. As we looked back to the south, toward the Great Pyramid, from the steps of the North building in the Nunnery Quadrangle, we saw a panorama spread out before us: The Governor's Palace, The House of the Turtles, The Great Pyramid and the Dovecotes. 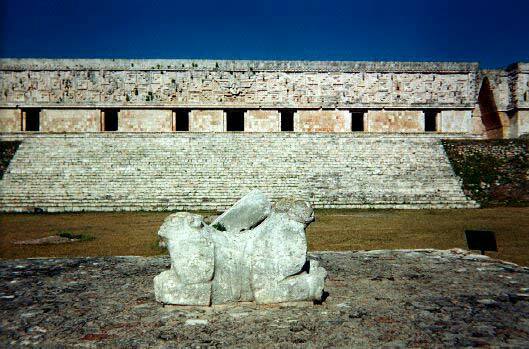 Behind us was the entrance to the North building with its Chac masks and a tablet whose inscription I could not decode. The day was beginning to fade as we walked back toward El Advino. As we came around one corner, several iguanas were sunning themselves on a wall. While keeping an eye on us, they moved to the side, remaining in the sun, while we passed. We again walked around the pyramid, grasping the unexpected form and the beauty and balance of the shape and the rounded river stones. We slowly walked back toward the hotel. At the hotel, we visited the gift shop where I acquired a panama hat and a long embroidered sash to use as a hat band and a few gifts for the grandchildren. Then we headed to the room to wash up for dinner. This chain of hotels, associated with Club Med, is really wonderful. They are located at many of the large archaeological sites in Mexico, offering nice rooms, good food, a big pool, a great patio, where you may eat, surrounded by blooming plants and trees that are great attractions for birds. We took our dinner on the patio, in the cool fall evening, and planned our day for tomorrow. 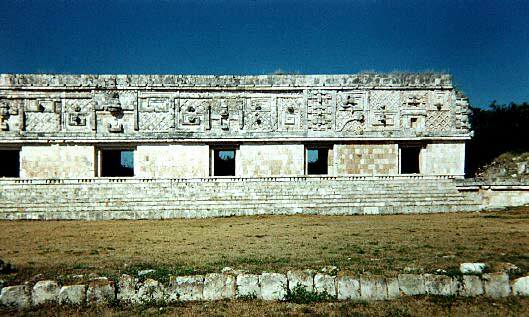 Our friends are flying in from Amherst in the afternoon and we will stay at Chichén Itzá for two nights with them. But tomorrow morning we will spend some time in Mérida, sightseeing, shopping, and eating lunch. This evening, we will just relax on the patio and let the dark sky, the sounds of the local community, and the night air drive the northern temperment from our hearts and minds.